Little Richard, born Richard Penniman on December 5, 1932, is the self-proclaimed “architect of rock ‘n’ roll.” Never one to be shy about his musical contributions, you cannot underestimate his importance and everlasting influence in American popular music. Beginning with “Tutti Frutti” in 1955 and continuing with “Long Tall Sally”, “Lucille,” “Good Golly Miss Molly,” “Rip It Up,” “Ready Teddy,” and so many more, his signature sound and look were defining contributions to the development of rock ‘n’ roll. 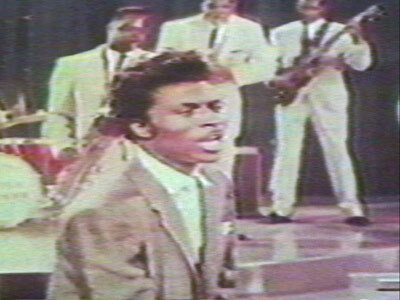 From Paul McCartney’s falsetto “woos” to the pompadour of Prince, Little Richard’s style transcends generations of rock performers. Richard’s career was never a smooth one. After an amazing string of hits on Specialty Records and show-stopping performances (including TV and film) he suddenly announced that he was abandoning rock ‘n’ roll for religion. In 1958 he formed the Little Richard Evangelistic Team and traveled across the country to preach. His musical releases turned to gospel, but while on tour in England in 1962 he began a return to rock. Greeted with enthusiastic audiences and adulation from young British rockers, it wasn’t long before he was back touring as the headliner. Among his opening acts on that tour were the up and coming Beatles and later, The Rolling Stones. His touring band, The Upsetters, featured the teenage keyboard player Billy Preston and a developing guitarist named Jimmy (later Jimi) Hendrix who joined the Upsetters in 1964. Jimi only lasted till the following year. He was fired over his tardiness, wardrobe, and especially his on-stage antics which threatened to upstage the legendarily flamboyant Richard. Throughout the rest of the 60’s and 70’s, Little Richard recorded for a succession of record labels and often was featured as a guest performer on other artists’ records. He quit rock ‘n’ roll again in 1977 after battling alcohol and drug abuse and returned to evangelism. He began another comeback in the mid-80’s with the release of his authorized biography, Quasar of Rock: The Life and Times of Little Richard and that’s when I had the opportunity to talk with him. It was my first assignment as the rock correspondent for TV’s PM Magazine and a fitting way to begin my latest adventure in rock ‘n’ roll. We filmed the segment at the Limelight, a New York City nightclub that was once a church in the fall of 1984. It was the perfect setting for the rocker evangelist who was about to be born once again. In January 1986 Little Richard was one of the original ten performers inducted into the Rock and Roll Hall of Fame. Later that year he had a featured role in the acclaimed film “Down and Out in Beverly Hills” and soon became a frequent guest on numerous TV talk and variety shows. He resumed recording and touring and finally seemed to be receiving the recognition he deserved for his contributions to the musical genre he had helped to create.